Question and answer sites come and go. Quora is today’s reigning queen. These are just a few things that interest me. You can search whatever interests you. You’ll find oodles of relevant questions. You’ll find oodles of answers, insights and ideas. You’re likely to spend oodles of time there. Oodling aside, my point is Quora marketing is a smart play—for any type of business and for all kinds of reasons. If one of your primary marketing goals is to deliver answers to those who have relevant questions, Quora is your silver platter. Quora is a social network created to foster knowledge sharing. The site has an Alexa rank of 72 in the U.S. That means only 71 websites get more traffic from U.S. users. 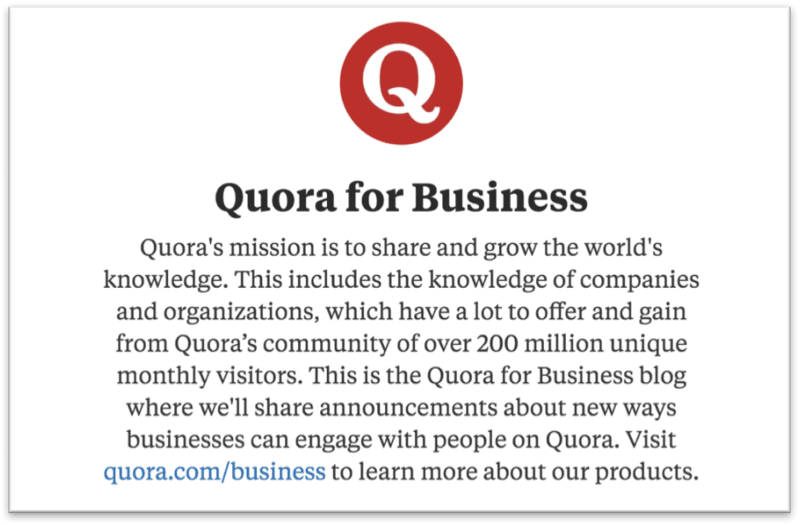 The Quora for Business page defines the network’s mission as: to share and grow the world’s knowledge. Given the audience size, it’s obvious Quora is not overlooked by netizens, but perhaps it is by marketers. Quora presents a tremendous opportunity to connect with a potentially massive audience. I’ve been involved in the past and am today, but I’d be joshing you if I claimed I was a Quora expert. I wanted to learn more about it and help you do the same, so I’ll share with you some of the best practices I’ve learned for Quora marketing and for taking advantage of the powerful resource. As is the case with any social media network, it’s wise to put some thought into the creation of your profile. Upload a picture as you would on any social profile. Use your real name. Quora isn’t about corporate brand building. It’s about personal branding. Populate the next line, “credentials,” with a few well-chosen words (amounting to 60 or fewer characters) with a description of what you do. An additional credential & highlights section enables you to enter information regarding your job, educations, location and language(s). Write a brief profile bio, format it as you like, and take advantage of the opportunity to link to your website, blog, and social media accounts. When prompted to enter topics you “know about,” enter as many as you like taking care to focus on the subjects for which you’ll be useful to the community when answering questions. 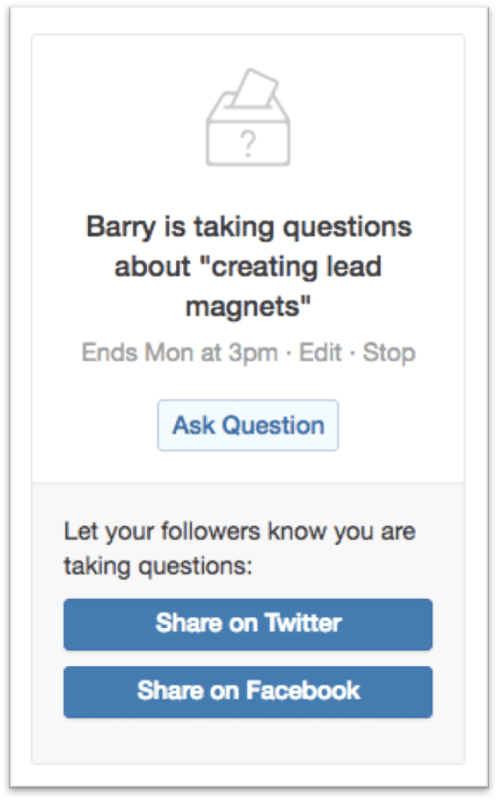 Serious Quora users will learn more about you here and make decisions about following you, receiving notifications regarding your activity and asking you questions. When someone visits your profile they’ll be offered all this information and more—including statistics regarding your activity on the site and a history of your answers. As you’ll read about here today, you can use Quora in a variety of ways. However, as a content marketer, your Quora marketing activity is bound to focus on answering questions. You could even think of Quora as an ongoing question-answering contest because Quora includes an “upvote/downvote” feature. So, like other online forums, the voice of the crowd is a factor. Author and podcaster James Altucher answers questions regularly and has earned a Quora following of more than 200K. The question above has inspired more than 100 answers to date, so the 1.2K upvotes help his answer rise to the top. I must admit, I can’t figure out how Quora applies the votes because answers aren’t necessarily presented in order of the tally. Of course, the better your answer is, the more likely you will achieve the goals you came to Quora for, such as: building credibility, making connections, driving traffic, and generating interest in your products and services. So, where do you find questions to answer? When you log into Quora, you’ll find suggestions for questions to answer—based on what it’s learned about you from your activity and profile. If you’re active on the network, and willing, you’ll receive emails with relevant questions. Users (fans, perhaps) can even request you answer a specific question. If questions are to come your way, you can choose to answer them—or not. If you’re trying to win favor with the Quora faithful, you should give it a try, especially when a request comes in. If you want to take full advantage of Quora, you need not wait for questions to come to you. You can easily find questions you want to answer. When you visit the site go into the “Answer” section, you’ll be shown relevant questions. Today, I was served these two questions. Clearly, Quora has learned (1) I write about blogging and traffic generation and (2) I’m researching a story about Quora (cue the Twilight Zone theme song). Quora also has a powerful search feature. A broad search will return a variety of questions related to your inquiry. Click on a question and the chances are high you’ll be shown a generous list of related questions too. I just discovered this (Quora evolves regularly)… You may get asked what you would like to take questions about—and can then share the notice on Facebook and Twitter. In my Quora quests to date, I haven’t found any approach to answering questions is out of bounds. I should mention I’ve read perpetual link bombing is discouraged and violators are subject to being suspended or blacklisted. So don’t link bomb. Don’t shy away from offering links either. The trick is to understand the reason Quora exists is to be a resource where people can find answers to their questions. Do your best to offer valuable answers and you’ll be fine. Referencing content and including links is a common practice. Carefully consider the question and write a brief response—words I’ve never typed before. Dig up a piece of relevant content you’ve written on the topic that will provide a useful answer and share an excerpt from it. Link to an expanded version of the answer. Cite a resource other than your own featuring an answer. Explain you’ve answered the question in a post and re-use the beginning or a part of the post with a link to keep reading. I like this approach. Copy and paste a relevant post. I like this approach too. It may seem heavy-handed and self-promotional, but I’ve found extremely relevant and thorough answers perform well. When possible, include images to help draw eyeballs to your answers. Post uninformative, overly simple, yes/no answers. Drop a link and nothing more. Argue, chide or ridicule. Keep in mind, Quora is open to everyone. Questions can be a bit ridiculous and any given question can generate a lot of junky responses. This may not be the first time you’ve read a post where a content marketer has suggested using Quora as a source to find ideas. Essentially, content marketing is about answering questions from potential buyers, customers, partners or any constituent that means something to the growth of your brand. Of course, these types of questions can come from anywhere, online and off, but Quora makes it too easy. It’s the ultimate place to source questions. 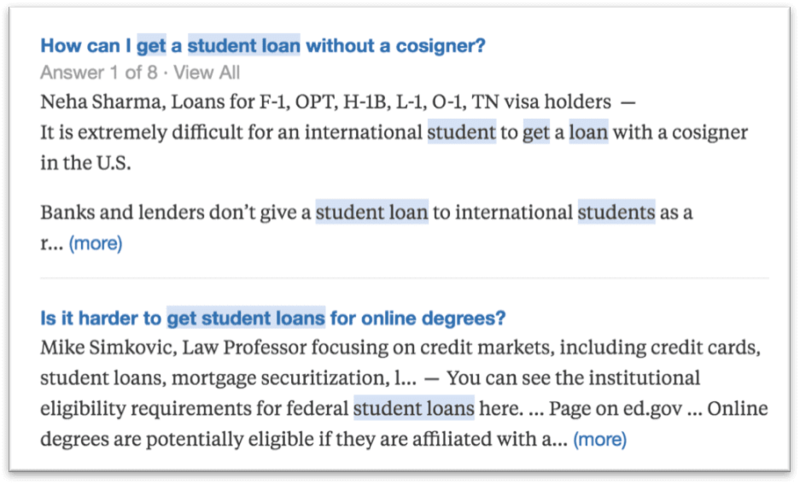 My search for “student loans” produced a long list of questions and answers archived on Quora. Nearly every one presents a potential topic idea. Above are two concerned with “no co-signer” and “online degrees.” On goes the light bulb. Questions you can address not only on Quora, but in your blog posts, videos, podcasts, ebooks, infographics, social media, etc. Questions you believe need better answers. Inspiration for related questions that may remain unanswered. The perspectives of your peers you may want to endorse, promote, share, add to, challenge, or counter. 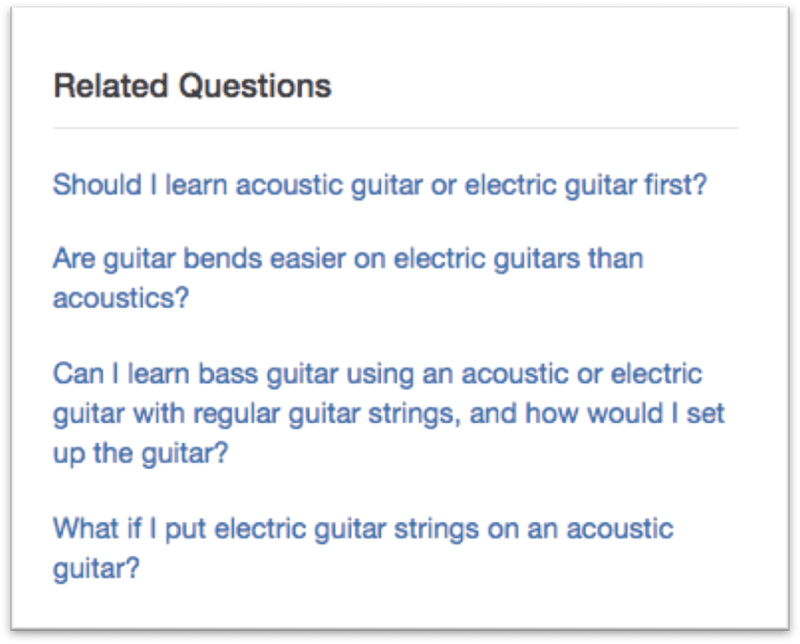 Keywords: look at Quora questions and answers with your search marketing hat on to identify keyword phrases that may serve you well for SEO and pay-per-click advertising. For instance (again, see above), according to my Google AdWords research, “student loan for online degree” is a legit keyphrase. You won’t find this tip everywhere—and it may not work every time. However, it looms large for me. In fact, using Quora as a source of content was one of the first things that occurred to me when I discovered the network years back. It’s simple: ask questions instead of answering them when you’re looking to crowd-source content. If you’re trying to create a roundup post featuring several answers to the same question, there may be no easier way than asking a smart question on Quora, gathering the answers, and curating them elsewhere. In 2011, I posted the question above and later used many of my favorite answers in a roundup post I wrote about social media marketing. Anyone can create a blog about anything on Quora. What are Quora blogs? It’s worth noting that 60% of Quora traffic comes from search. Great blog posts and answers rank well and draw a crowd. Want a few more Quora marketing tips? Try Quora advertising—Quora advertising has existed for a few years now and offers in-page ads, retargeting, mobile app ads, and a simple solution for conversion tracking. Learn more here. The page I linked to above includes a success story about Asana’s success with Quora advertising, by Puja Ramani. 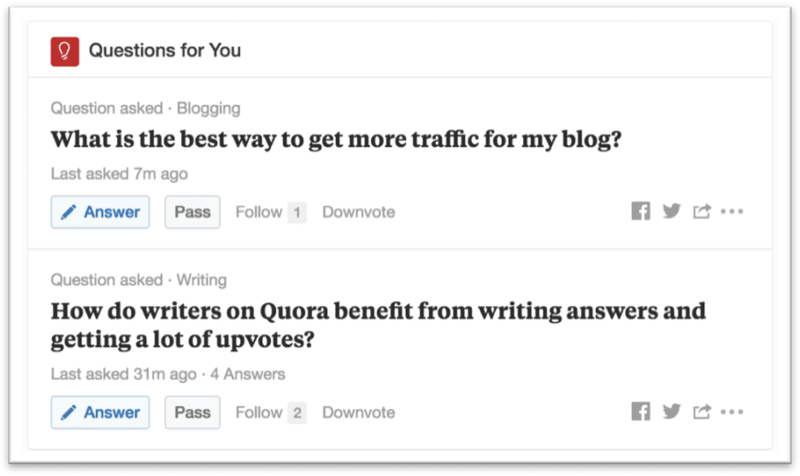 Ask questions—Though this post mostly highlights delivering answers for your Quora marketing strategy, join the party there by asking questions too. You’ll gather useful feedback and ideas while being a more well rounded member of the community. 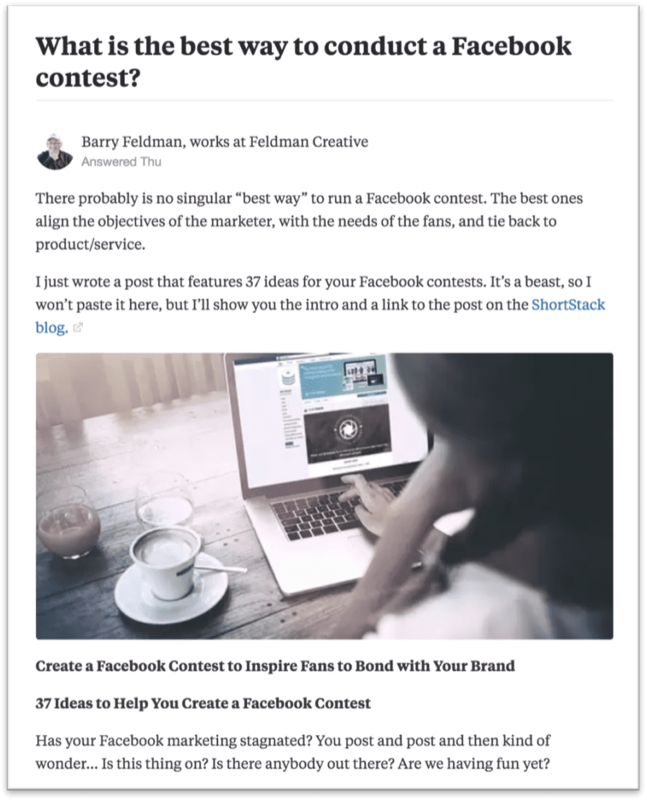 Engage and connect—Use Quora socially to engage and connect with influencers, peers and customers. Take advantage of the opportunity to ask questions to specific members of the community to build rapport with them. Upvote—Spend some time reading responses and upvoting the ones you like. The authors will be alerted so your efforts won’t go unnoticed. Re-use your best stuff—Here’s another great Crestodina trick. Keep track of the questions you answer on your blog, in roundups, or social media and re-use versions of them when you discover a similar question on Quora. Cite sources—When you’re answering a question in detail, cite your sources and use links to increase your credibility. Focus—In her Quora Marketing 101 post on Teachable, Morgan Timm recommends becoming active in one community. “If you’re answering questions in a dozen different niches people will see your account and not know what to expect. If you have positioned yourself in one niche, people in that niche will want to follow you,” writes Morgan. 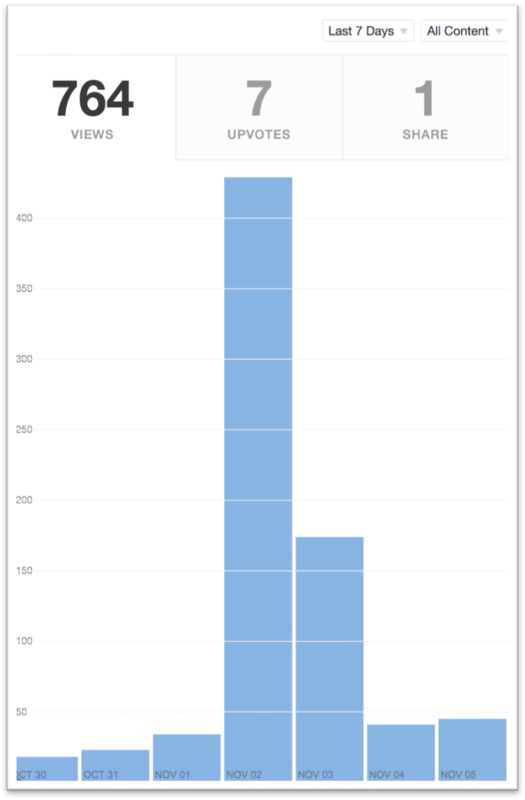 Use Quora analytics—Quora won’t offer you deep analytics, but you can examine the results of your questions, answers, posts or all of them combined by various date ranges. Spikes in views, upvotes or shares should provide some meaningful feedback. As you can see here, I did something that helped my cause on Nov 02 and earned a substantial number of views. I found a question that perfectly aligned with a new post I had written for the ShortStack blog. To answer the question, I wrote an original, but brief, introduction, and then I pasted in an image, the title and beginning of the post, and linked to the entire post. What are the most popular topics on Quora? Great question. In 2014, Thomas Foster (B.A. Politics & Journalism, Monash University) did the research and provided a great answer. How could I not wrap this post up by asking for questions? If you have questions about Quora, please fire ‘em at me below and I’ll do my best to answer them. If you have questions about anything else, you’ll find answers on Quora. And, of course, if Quora marketing appeals to you now, it’s time to get over there and start answering questions. great article barry. so here’s my question. there’s not enough time in the day to convert quora questions into long form content. I write a long form answer on my blog complete with garnishee (images, hyperlinks and videos). Then I hand copy to quora (and medium as time allows) removing hyperlinks and lighting up videos. It’s my understanding that quora has no follow links thus my blog wins the seo round and my stats rise on quora. It all sounds reasonable to me, so, yeah, I think you’re doing smart stuff there. However, I’m not sure why you’d extract the links. If they’re useful links, why not include them? If you are copying your long from answer to Quora from your blog aren’t you creating duplicate content? Even though Quora has a “nofollow” attribute on all external links on posts doesn’t mean that the content on a Quora URL doesn’t get indexed. So yes, both Neil Patel’s blog post and its copy on Quora would be indexed and therefore found on Google. But in these cases a canonical tag will help search engines to differentiate who’s the original publisher. Also, since it has been introducing language-specific versions, business looking for an international reach should consider joining, as well. I did come across some info about the foreign language versions while researching this post, so thanks for adding that AndyT.